The key to making AM productive enough for wider adoption across these high-volume industries, however, lies in process economics – choosing the most effective manufacturing process for each part. High volumes, productivity and cost-per-part are often cited as reasons for additive manufacturing (AM) processes, especially with metal materials, not meeting the needs of the automotive industry for production applications. Betatype is one company challenging the current status quo, that has worked on a specific automotive project using the laser powder bed fusion (LPBF) process to produce 384 qualified metal parts in a single build. This was achieved through design expertise and Betatype’s unique optimisation technology that translated to reduced part costs ($4 versus $40+) and reduced lead times (from 444 hours to 34 hours). When it comes to automotive and other consumer-facing industries focused on producing high volumes of parts at low costs, the current generation of Additive Manufacturing (AM) processes is generally considered incapable of meeting these needs. The key to making AM productive enough for wider adoption across these high-volume industries, however, lies in process economics – choosing the most effective manufacturing process for each part. Combining these principles with Betatype’s knowledge of the limits of additive – as well as how and when to push them – together with the company’s powerful optimisation technology, supports customers with the design and production of parts that not only perform better, but that are economically viable against existing mass production technologies. Often AM is described as a process that is capable of any geometry. In reality, AM can provide greater design freedom than other traditional manufacturing processes, but still comes with its own set of constraints. Understanding these constraints is imperative to identifying applications that fit well with AM, namely those with specifically complex geometries that work best with the physics of additive processes. This thinking has traditionally only been applied to low volume parts, however. Die casting and other traditional manufacturing processes can manufacture millions of components per year, while AM processes such as LPBF can excel and add value by delivering geometric complexity with the least amount of material possible, but not economically at high volumes. This has long been a trade-off, one that has seen automotive companies dismiss AM for production applications — but this is changing. Betatype’s unique expertise and technology portfolio demonstrates how it is possible to combine the innate geometric capabilities of AM with increased production volumes of cost-effective parts and improved performance. With the right part, it is completely possible to break with conventional thinking about what LPBF is capable of, both in terms of what can be built, how and how many. An example of how Betatype can demonstrate this emerged from the Automotive industry’s switch to the use of LED headlights, which brings with it new challenges in thermal management. 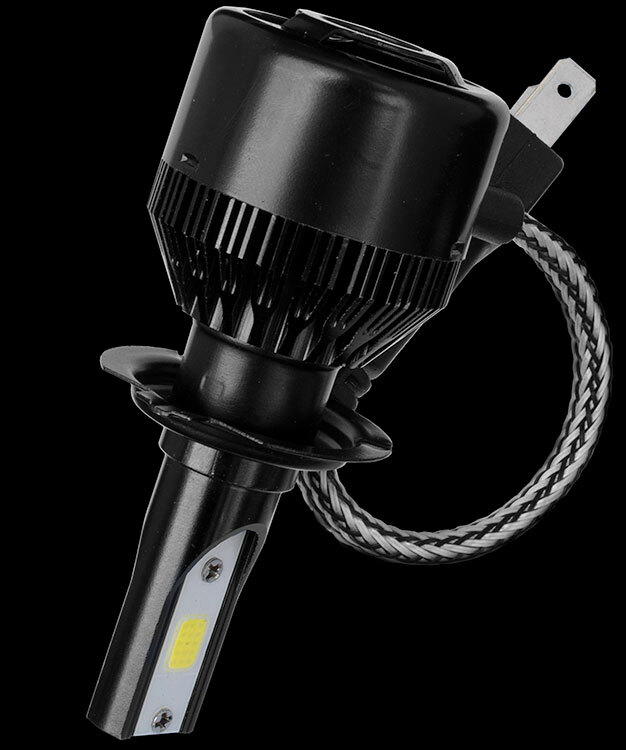 Automotive LED Headlight / Example of a complete aftermarket product. 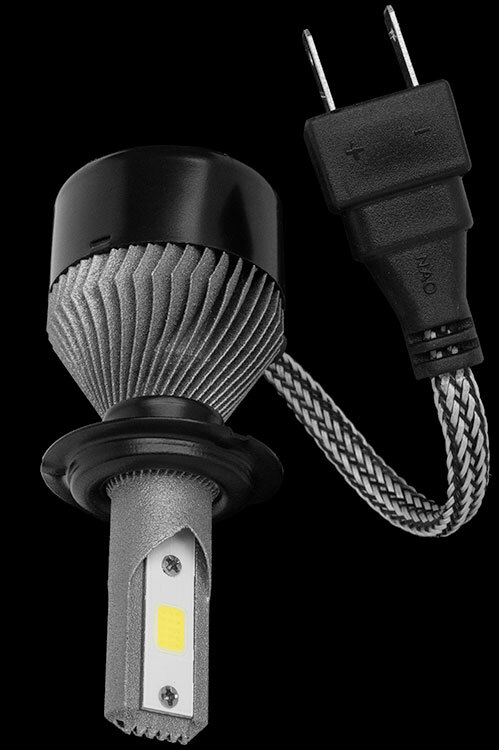 Automotive LED Headlight / Redesigned LPBF Heatsink, compatible with aftermarket design. Production Build of Automotive LED Heatsinks / Manufactured by Progressive Technology on an EOS M280. Typically, these new components require comparatively large heatsinks which are often actively cooled. Betatype recognised that the specific geometry for these metal parts made them ideal for producing with LPBF, which can consolidate multiple manufacturing processes into a single production method. By considering the LPBF process at the initial design stage of the component, Betatype was able to design a part with in-built support features, which allowed multiple headlight parts to be stacked on top of each other without the need for additional supports. It was then possible to snap apart the finished parts by hand, without the need for further post processing. Full stacking is often deemed extremely difficult with LPBF due to the thermal stresses involved in the layer process, but by intelligently designing the structure to reduce thermal stresses, Betatype was able to make it a viable option with minimal thermal distortion. The innovative design of the part enabled a series of them to be ‘nested’ together to maximise the build volume, resulting in 384 parts being produced in one go within a single build envelope by Progressive Technology on an EOS 280M system. Betatype’s expertise in design and data processing technology mean they can easily design, manage and optimise every toolpath within each part. Through specific control parameters, the exposure of the part in each layer to a single toolpath where the laser effectively melted the part was reduced significantly, with minimal delays in between. This, coupled with Betatype’s optimisation algorithms and process IP, reduced the build time of each part from 1 hour to under 5 minutes per part. That’s 10x faster than using a standard build processor. Equipment amortisation is still a major driver in part cost. Reducing build times is key to making parts more cost-effective with LPBF. Betatypes’ optimisation technology is a key factor here and for this application with metal material, has demonstrably brought cost-per-part down from upwards of $40 to under $4. Moreover, on single laser medium frame (SLMF) systems, such as the EOS M280 and Renishaw RenAM500M, Betatype was able to reduce build time from 444 hours to under 30 hours for the 384 parts. With the new multi-laser, medium frame (MLMF) systems (SLM Solutions 500, Renishaw RenAM500Q) this optimisation approach further reduced this figure to under 19 hours. Using these high productivity systems, it was possible to realise a 19x gain in productivity over a year of production per system from 7055 parts to 135,168. With an installation of 7 machines running this optimised process, volumes can approach 1 million parts per year — parts that are more functional and more cost-effective. 13x the productivity per system. Estimated Number of Parts per Machine per Year / Model built on build times provided by Progressive Technology for SLMF system (EOS M280) and Renishaw AMPD for MLMF system (RenAM500Q). Up to 90% reduction in part cost. 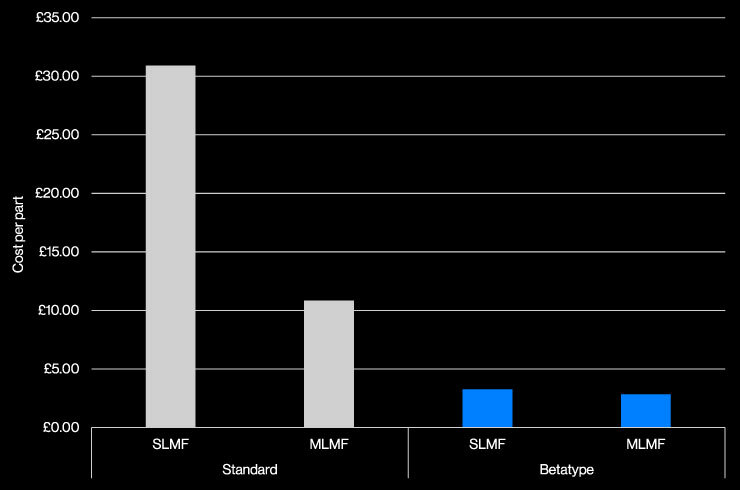 Estimated Cost per Part / Model built on build times provided by Progressive Technology for SLMF system (EOS M280) and Renishaw AMPD for MLMF system (RenAM500Q). 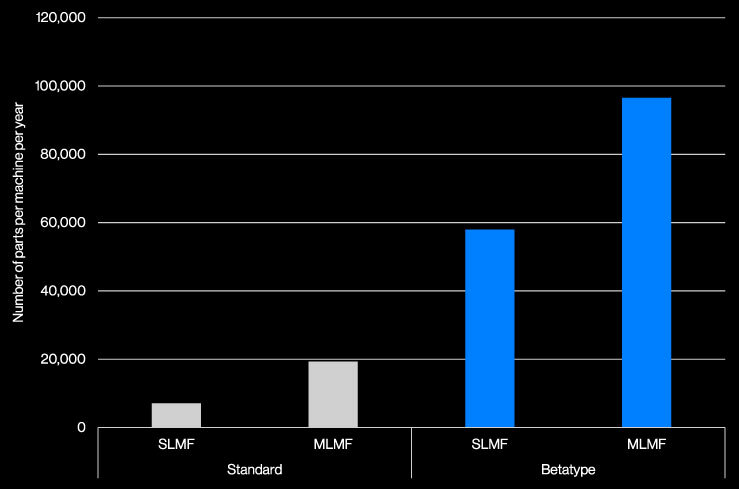 Betatype makes Additive Manufacturing (AM) perform. Founded in 2012, the company collaborates with customers across a variety of sectors including consumer, industrial, aerospace, medical, and motor sport — working together to deliver functional components through AM. 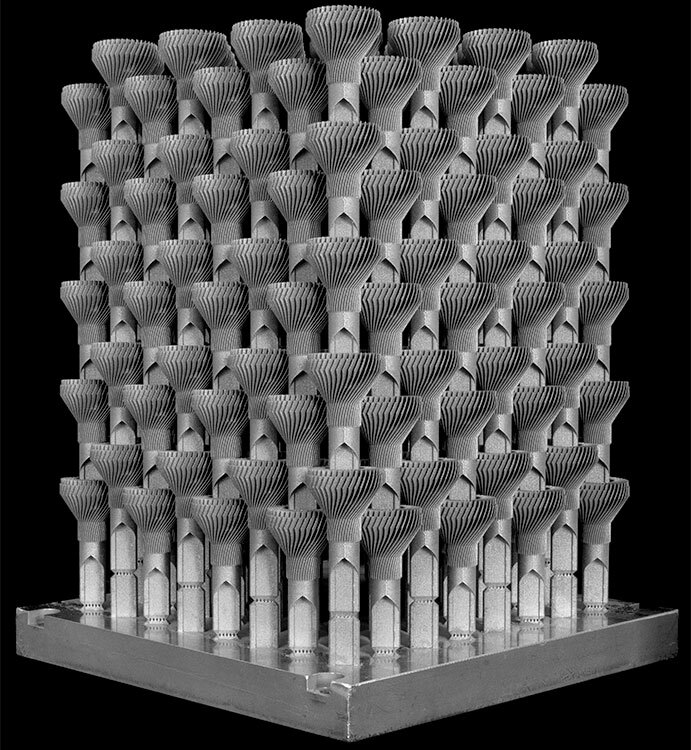 Additive Manufacturing provides control over shape, structure and material in a single process. To maximise these capabilities, Betatype built “Engine”, a new data processing platform for managing and controlling multi-scale design. By combining Engine with the company’s team’s strong foundation in material science, engineering and industrial design, Betatype can achieve greater fidelity at every scale of AM part design — from part form and architectured materials to AM process physics. Betatype’s unique multi-scale approach delivers on the promise of AM. The company applies it to design complex parts that cannot be easily built through traditional processes and ensure they can be manufactured viably.